The iPhone 6 could ship with a reversible USB cable according to new leaks, putting an end to the interminable fiddling that seems to plague most of us when plugging our smartphones in. 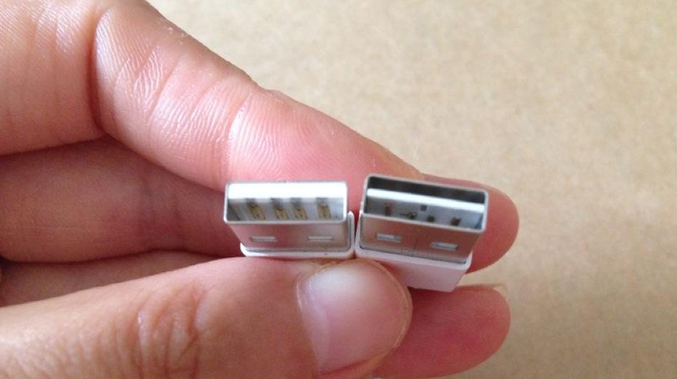 Apple already has their own reversible design in the form of the Lightning connector, but this standard only works with the company's own devices- they still have to use the USB standard to connect to computers and chargers. The leak comes courtesy of Sonny Dickson who tweeted the image (above) of a redesigned cable. Dickson has previously predicted that the new iPhones would ship with an 'unscratchable' sapphire display - although recent reports suggest that this will instead be a less-costly sapphire-glass mix. Interestingly, the design matches an Apple patent from 2013, with the all-important contacts affixed to a thinner, central plate instead of located on only a single side of the plug. Importantly, this would allow the orientation-agnostic cable (yes, they do get called this) to work with all existing USB ports - unlike the forthcoming Type-C USB standard which is similarly reversible, but which will only work new ports.